What would you do with an extra $10,000? How would you like a chance to spend it? At Uftring Weston, we're STILL celebrating our Grand Opening at 1600 W. War Memorial Drive in Peoria by giving away $10,000 in cash! Stop by our all-new Chevrolet Cadillac dealership today and drop an entry into the drawing box. While you're there, take a stroll through the lot and come inside to check out the showroom to see our gorgeous new dealership. We're proud to call it home and we'd like to share it with you. A winner of the $10,000 cash will be drawn on November 20th and be notified (by email only). Don't miss your chance to win! For more information, call us at (866) 979-6448 or stop by the dealership. Good luck! 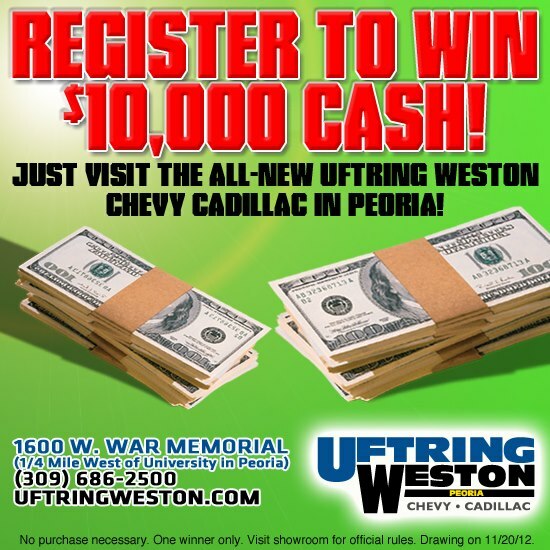 Visit our Peoria IL area Chevrolet Cadillac dealership online at UftringWeston.com.